The general message of the protest was, “Out with the Occupation. This time is the last time.” The call to move forward towards the checkpoint was given. Immediately afterwards, an Israeli commander presented ISM coordinator Abdullah Abu Rahme with an order that apparently stated that the area was a closed military zone, and that the presence of the protestors was forbidden. The commander then attempted to announce on a bullhorn that crowd had ten minutes to disperse.He was, however, drowned out by whistles and booing from the crowd. The world sees a great and ongoing injustice. Should it remain silent? It is not, of course, the only injustice in the world. Nor is it the most terrible. But does this make it any less necessary to act against it? It is easy to exempt ourselves from our moral responsibility and attribute, as usual, any criticism to anti-Semitism. There may indeed be some elements of anti-Semitism among those calling for the boycott. But also among them are groups and individuals, including quite a few Jews, for whom Israel is close to their hearts. They want a just Israel. They see an Israel that occupies and is clearly unjust, and they believe they should do something. We should thank them for this from the bottom of our hearts. The economical impact of the crisis. Saturday May 27th: I have returned to Ramallah. I feel a little worried I’m getting used to certain things I shouldn’t really be used to. When I was coming back in the taxi from al-Quds/Jerusalem, driving through Ar-Ram and Qalandia, the Wall is alongside us on our left, and separates people’s homes from stores and vice versa. The sight of the Wall, the fucked up Qalandia “terminal” – it’s not occurring to me anymore to describe or write about these “small” things because they don’t seem to me to be anything worth noting anymore. They’ve become “normal”. I don’t know whether to be happy or sad, whether this means I’m “stabilizing” or getting more numbed in regards to the situation. But I’m reminded I do need to write about these small things. Like I wrote in my last trip, getting into the West Bank from Jerusalem is much easier than vice versa. Still part of the road to Ramallah is blocked off for no ostensible reason and we had to drive through the side roads. The Qalandia “terminal” is still as messed up as ever, still the soldiers barking orders through microphones, sitting behind windows in cubicles, still metal revolving gates and sanitized apartheid. It’s getting really hot here now as well and the sun is pretty strong. 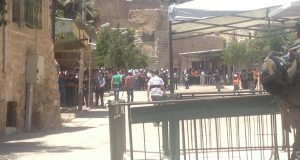 When I was going back to Jerusalem a few days ago, we had to get off from the shared taxi to walk through this “terminal”. A young woman with a baby asked in a somewhat sarcastic tone, can’t people with small children stay on? Unfortunately not. Because of getting asked by every single new person I met, I decided to take out my nose and lip ring. When I was putting my bag into the back of the shared taxi at the stand in Jerusalem one of the drivers recognized me and starting telling me how much better I looked and how happy he was to see much without the piercings. Yay, victory for gender conformity and heterosexism. 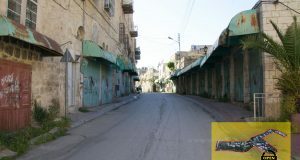 Our friends in the Tel Rumeida neighborhood of the old city in Hebron/al-Khalil are getting stoned, spat on, assaulted almost daily by the little kids of fanatical ultra rightwing Jewish settlers who deface houses with slogans such as “gas the arabs” and yet when they do this the supposedly law enforcing Israeli police just looks the other way. The most pathetic thing is they send their children to harass Palestinians, because the army/police won’t arrest minors under the age of 14. Talk about cowards. There were lots of PA security forces of different kinds on the streets of Ramallah today. I just read that Israel has allowed transfer of light arms to forces loyal to Mahmoud Abbas – talk about local enforcers of the occupation. Between all the different kinds of Palestinian Authority and Israeli occupation forces, I’m getting a little confused. I visited Birzeit yesterday where I will be taking Arabic classes later on and liked the look of the place, it is really pretty and a small village, quiet and green unlike noisy bustling Ramallah that reminds me more of neighborhoods in New Delhi (not that that’s a bad thing). I’m looking forward to being based out of there though and living in a more quiet green area, plus its only about 20 minutes (and 3.5 shekels ie less than $1) from Ramallah. The people that I met in the program were nice, seemed on top of their stuff, but somewhat condescending and power-trippy, kind of like at Columbia – birzeit is supposed to be the “Harvard of Palestine” whatever that means, maybe it’s a similar complex. I detest hierarchies and power in general, if I could only get rid of my own personal dependence on them sometimes. I didn’t really like the way they intimidated me about my level of Arabic and made me feel like my Arabic education was inferior to theirs (funnily, my professor in the US said the same thing about them!) and told me to review for the “placement test” which will decide which level of Arabic I can be in. Blah, blah. I met another international student from Japan and sat with her and a Palestinian student. He was really nice to me and gave me friendly advice to not tell anyone if they asked me my religion that my mother is Jewish because: a) there are some folks around who don’t distinguish between Zionists and Jews, unfortunately; and b) the Palestinian security forces monitor international students at Birzeit for spies and saying something like that would make them more suspicious. I’m not saying it’s the right thing to do, but probably a wiser thing. Walking back to the ISM apartment in Ramallah, I bought Ghassan Kanafani’s story “Returning to Haifa” in its original Arabic. I had read it in English this semester for a class on Israeli and Palestinian literature I took that was awesome. It’s short enough that I think it’s a reasonable reading project in Arabic. Everyone should check out his writings for the best of Palestinian resistance literature, especially this story. I was also taken out to a nightclub in Ramallah and got to observe from close quarters members of the occupied Palestinian upper class. Seeing people dance to reggaeton in the occupied territories was an interesting and amusing experience. It was something light and fluffy that I felt I needed for a while. Let’s see what the next few days bring. Distilled excitement, hopefully. 7:30 pm, Tel Rumeida St, just outside the ISM apartment A Spainish HRW was in the street playing football with some Palestinian children. 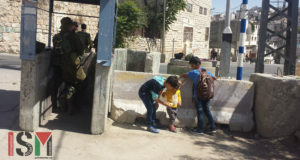 Ten or twelve settler children, around thirteen years of age came up Shuhada st, swearing at the Palestinian children. The HRW and a Palestinian man went to stand in the entrance of a nearby Palestinian store. The children threw stones at them, until the soldier on duty shooed them away. They moved up Tel Rumeida road, to a nearby Palestinian house, taking a table from the front yard and tossing it into the street. Q: What if you live in Tel Rumeida and you have a heart attack ? This is of course if you can make it out of the Israeli controlled part of Hebron into the Palestinian controlled part without dying first. So, Americans.. you go to the emergency with no health insurance, get a blood test and an injection.. I think it would be safe to say that you can count on paying minimum $400 for this. This is democracy ! We can give billions of dollars to Israel and spend God knows what on a war in Iraq but we cannot afford to give all our citizen health insurance.